"Zero was launched for pre-order in November 2015 and we recently got the reply from the factory that there will be an increase in production cost as the quote they given were not valid anymore. Since the number of orders cannot cover the cost, we have no other option but to cancel the all the productions of Zero. For customers who have placed the order, we will refund all the deposit you made within 2-3 days. We sincerely apologize for the cancellation. Should you have any inquiries, please fill in the Contact Us form in our website." So that's the end of that. There's not much else to say on this topic other than be on the lookout for your refund. Thanks to Strider Edge for the tip! Good. Cancel them all, now and forever. I'm sick of hearing about boring, useless figures. GIVE US GAMES! Why would a model/figure company make games? That's not what I said. 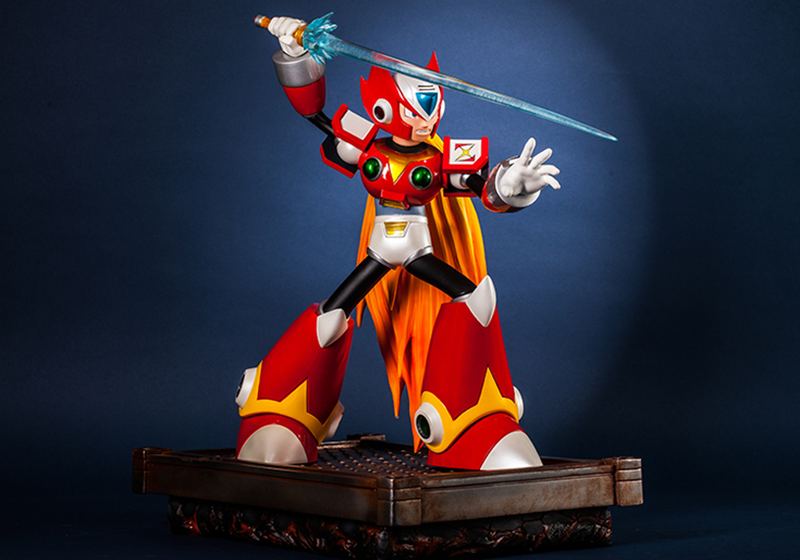 I'm sick that the only news I hear about Megaman is pointless figures. I'll never understand the people that waste their money on useless pieces of plastic that sit there and do nothing. It doesn't just sit there if you play with it. Unfortunate, but to be honest, we've gotten so many Zero figures and statues and this one looked like the worst of the bunch. Not much of value was lost. Let's be honest, the statue is ugly. Gonna be honest I didn't even remember this existed. It goes to show how many figures and statues are being made when I can't even keep track of them all. At first I was like another GOTDANG statue/figure, until I read the title fully and realized this was announced a while ago. Freaken expensive hobby figure collecting is. Ewwwwww........well, no one will miss it. I've always thought this was ugly -- in addition to all First4Figures Mega Man scuplts -- so I don't particularly see this as a loss. I'm going to guess that "production costs" were higher because they did not receive enough pre-orders for this; their quote was probably not valid because they didn't meet the factory's quota. Good riddance; there's better stuff on the horizon. You don't have to guess, the explanation is right there in the article. Yes, the orders were not enough to cover the costs. Mainly because of an increase in production costs from the factory. I personally purchased the statue and see nothing really wrong with the sculpts. Sure, some of the proportions are a bit off, but overall, once you receive them, the quality and care is apparent. A disappointing loss, but I did inquire with them if and when another factory is found, Zero would be put back into production. They couldn't say for sure but they did express interest saying anything is possible. Goodness, you'd think I'd be used to all the negativity the Mega Man fanbase oozes. Guys, this statue wasn't bad. Do keep in mind that they fully intended on perfecting it and changing the face. They listen to the fans and try to make their products better, but with all the feedback companies probably see here and elsewhere, not just in regards to merchandise, but the series in general, we're lucky to continue getting anything in the way of Mega Man at all. There's always something wrong with something. Always. I appreciate everything that comes our way, but if something is off, I try to express myself constructively, rather than some of the comments above. It doesn't make a good impression, guys. It's pretty ugly and I don't understand how these guys messed up X (which released) and Zero's necks like that. It's unbelievable considering their prices. Actually he gained enough support that they are making him now. All the latest F4F stuff happens on their official F4F collectors club on FB. Yep, I just came here to post this same thing; the F4F Zero statue has been resurrected. I'm still not a fan, but good for those people who want to own it. It can't be too surprising when expensive statues don't have enough pre-orders to justify a production run. It seems like this is the moment where the "Who has this kind of money?" question is finally getting answered. The designers and producers of these thing need to understand that the market is flooded and the taste for them is limited. I've bought precisely ONE when it showed up on Capcom Unity several years back and regretted the price then, which seems like pennies compared to what they go for now. As stated above, the F4F Zero statue is going to be re-launching for pre-order later this year. The head has been reworked, as it was, by far, the largest complaint about the statue. The pose couldn't be changed, as it would raise production cost TOO much. If anyone IS interested, information will be shared out at a later date, when more details are released. As stated above, the F4F Zero statue has been approved to relaunch. A new pre-order will be held later this year! The head has been reworked, as this was the most common complaint about the original (pictured) sculpt. The pose couldn't be changed without raising production costs TOO high. For anyone interested, information will be shared out as details become available. Feel free to join the Mega Man Collectors' Club on Facebook, we'll be sharing information about this, and others, as we receive it.